Pipeline filter is an essential equipment in the pipeline series for medium transportation. It's usually installed in the inlet of reducing valve, relief valve, water valve or other equipment to eliminate impurities in the medium to protect normal use of valves and equipment. The filter has advantages including advanced structure, small resistance, easy drainage, etc. Applicable medium can be water, oil and gas. Filter mesh can be made according to users' request. When cleaning is needed, just remove the removable cartridge and reload it after the filtered impurities are removed. The operation and maintainence is very convenient. The filter has small size , thin filter holes, small resistance, high effect, low cost, and is convenient in installation and maintenance. Based on the different working conditions and installation methods, pipeline filter can choose four types of structure forms: Y type filter, T strainer basket, basket filters, and parallel filter. 1, Corrosive materials in chemical industry and petroleum chemical industry, such as water, ammonia, oil, hydrocarbon, caustic soda, strong dilute sulphuric acid, carbonic acid, acetic acid, ester acid, etc. 3, Low temperature material such as for cooling , such as liquid methane, ammonia, oxygen and various cooling agent. 4, Materials with sanitation requirements in ligh industries including food, pharmaceutical production, such as beer, beverage, dairy products, syrup medical supplies, etc. 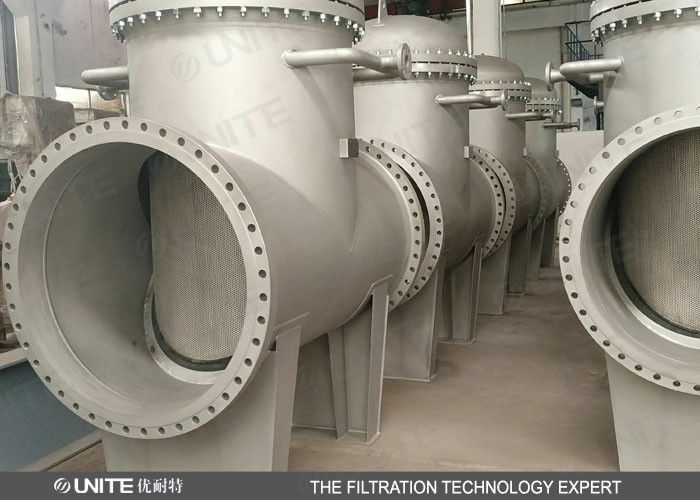 6, Pre-filtration for protection of downstream equipment.